What a special evening we have planned for you this coming Friday, February 14th. 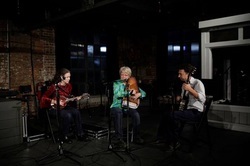 To start it off, The Tin Cup Rattlers, featuring Marcy Paulson, Jeff Paulson, Joe Ridolfo, Barbara McCuiston and Peggy Douglas, will be bringing an old time sound to our social hour…. Yes, I said social hour. The folks at UTC are providing finger food goodies to start the evening off at 7:00. Then a few of the writers; poet and prose alike, will be reading their works from the Sequoya Review (UTC’s literary magazine). Also, we will be showcasing on the big screen some of the artists whose works appear in the publication. Did I mention everyone in attendance will get a free, that’s right free copy? All this for the nominal $5.00 you are used to paying. Join us for this special evening and help support these student writers. We will be starting at 7:00 as promptly as possible so hurry on down!